Bob Barker feeds Ruby Anniversary Cake. 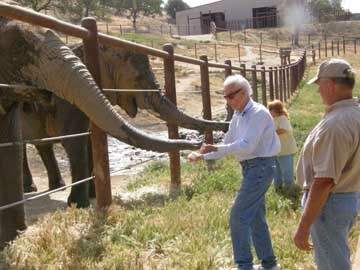 On May 15th, one year from the date of her arrival at ARK 2000, Ruby, the former Los Angeles zoo elephant, received a surprise visit from her benefactor, Bob Barker. 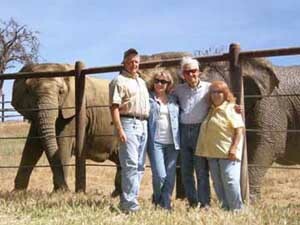 The beloved, retired game show host and a television crew from “Entertainment Tonight” spent the day with Ruby and her elephant companions who shared Ruby’s special treats on her anniversary. Ruby refused to share her sugar free anniversary carrot cake with the other elephants, and greedily devoured the delicious concoction as the film crew recorded the event. “She even licked my fingers,” Barker stated as the giant elephant’s trunk gently cleaned the remaining crumbs from his hands. and Pat Derby-Mara and 71 in the background.